It’s easy to forget about your plumbing system before it’s too late. If you aren’t experiencing more obvious signs of corrosion or damage, such as water discolouration or bursting pipes, you might consider your piping to be in good shape. Depending on the type of plumbing in your home and it’s age, you might face different water quality issues that signify a replacement is needed. It’s important to first contact a plumber to conduct an inspection of your pipes to avoid further costs in the future, but keep the below signs in mind if you suspect your plumbing might be on it’s last leg. Low water pressure from your faucets or shower heads could be the result of leaks in your pipes or a buildup of rust. If your water pressure is significantly and consistently low, especially your hot water supply, this could be the result of an older system that’s in need of replacement, or damage to your piping. Leaking pipes can not only lead to low water pressure and high bills, it can also cause mold and water damage to the structure of your home or building. Even a small leak can be a sign that you’ll soon be facing even more repairs in the future. Most modern piping can withstand extreme temperatures in the winter. However, older or damaged systems are more likely to experience freezing and potential bursting. If your pipe has experienced frequent freezing, it’s time for a replacement before it bursts. If your pipe has burst, contact a plumber immediately. Older piping corrodes and releases contaminants into the water supply. If your water supply turns a red colour, or is visibly dirty, it’s likely time for a replacement. Discolouration could also signify dangerous contaminants in your water supply, such as lead. If your pipes are leaking, you’re likely going to experience higher bills from wasted water. If you notice a spike in your water bill compared to previous months, it’s likely time to call a plumber for an inspection. Noticing these warning signs ahead of time will help you to prevent high costs in the future that result from damage to your home. Whether you have an older piping system or a more modern one, your pipes are still susceptible to damage and require a yearly check-up. 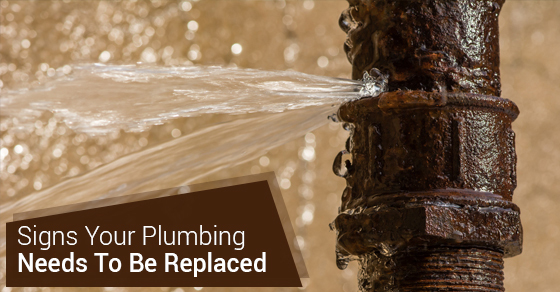 If you think you might be in need of a replacement, contact an experienced plumber to learn more about your options.